After a lovely afternoon of venison sausage and oyster consumption at Flatbush Farm, Ralph Lauren tie designer Sean Crowley and his lovely girlf Meredith Modzelewski invited Porter and me over to their amazing Fort Green brownstone for a bit of a tipple. Sean, owner to the world's largest collection of spirits, ties, shirts, vintage umbrellas, cricket team photos, 1920s jackets, heraldic doodads and more, shook us up the most amazing concoction: grapefruit juice, bourbon and honey. The first moment the Brown Derby touched our lips, we were sold. Here we had our new summer cocktail. 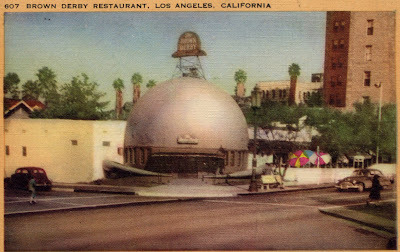 The first Brown Derby, also known as the Little Hat, was opened in February 1926 across the street from the Ambassador Hotel. The Derby was often the site of afterparties following bashes at the Ambassador Hotel's Cocoanut Grove nightclub. This was the only Derby that was actually built in the shape of a hat. In 1937, it was moved one block up the street. So here is the recipe as relayed to Sean by the No. 1 barman at Little Branch, Sammy. Sean suggests: I like to use a long thin bar whisk to pre-emulsify the honey before adding cracked ice and shaking the thing till I fall over. Serve in a chilled glass unvarnished and ungarnished.